As a wheelchair-bound paraplegic (and owner of multiple so-called “assault weapons”), this correspondent is quite familiar with the issue. Yeah, read all of Kurt’s article here. He’s dealing with the fact that the so-called assault weapons ban is highly opposed by the disabled. I’ll bet so. I was entering a home just yesterday in which I didn’t know who or what (animal) was there to do me harm (I won’t go into the details of what home or why I was there). I did room clearing exercises for about ten minutes before I went to work on what I went there to do. I moved freely and without hindrance, but as dictated by the room layout and the general rules for performing such tactical maneuvers. I never paused to think about how something like this would be done if I was disabled. Limiting the weaponry you allow a disabled person to use – or anyone for that matter – is morally obscene. Read the rest. My bet is that David’s column pressured the Illinois police into doing their jobs. Speaking, you know, of the morally obscene as we were. The National Shooting Sports Foundation has released a poll today that shows only 40% of Americans want universal background checks at gun shows. The difference in the poll results is because contextual detail was added to the question. Instead of asking do you want to close the “gun show loophole” or other such nonsense, the poll points out that most sales at gun shows are conducted with background checks and are by FFLs. The poll goes further. Only 39% of respondents thought that requiring a background check for transferring a firearm between friends or family members would reduce violent crime. That’s a long way from 90% in my calculations. But my readers always knew it was a lie from the beginning. Mike Vanderboegh is pressing ahead with his “Toys for Jerks” program, which he covers here, here, here, here, here, and so on. Go read his site for updates periodically. The New York Times admits gun reporting screw ups here. If you’re interested go take a look. It goes to show that the writers for the NYT don’t know anything about guns – or even rudimentary mathematics like measurements and fractions. But you knew that already, didn’t you? Perhaps before landing a job reporting for the NYT, they ought to require that their reporters go get a real job for ten or fifteen years first, you know, something like pouring and finishing concrete, doing steel rigging, welding, roofing, carpentry, etc. A real job. Instead of what they do. A couple of weeks ago Slate reported on mass shootings in America. It turns out that they aren’t on the rise, and that they are not committed by mentally unstable people who suddenly snap. They are committed by evil people bent on wicked behavior, and their numbers have been pretty stable. But as a regular reader, you knew that already, didn’t you? No, seriously, you already knew this. It’s a wonderful season. The wife is cooking and making gifts, it’s time to retreat from work and relax, and it’s time to remember the birth of the Christ. If Christ was merely a good man or example for us, then there is no perfect sacrifice as a vicarious atonement for our sins. But He was God incarnate, and thus we have a savior. “Behold, the virgin shall be with child, and shall bear a Son, and they shall call His name Emanuel, while translated means, ‘God With us'” (Matthew 1:24, NASB). We remember this event on which all of history turns and upon which all of history depends by giving gifts. This isn’t necessary to remember and worship Christ, but it has become customary. My wife honored me with this. 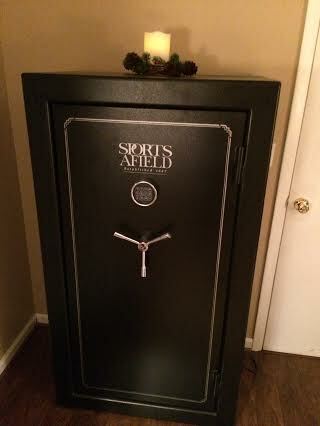 A 32 gun safe. Oh, and just for good measure, she bought me another nice weapon to go inside (you’ll soon see pictures of this too). And notice the power cord attached. No flashlights necessary to see inside. Merry Christmas from me and my family to you and yours. God bless you for the new year. Worship the new born King. The man credited with the design of the AK-47, Michail Kalashnokov, is dead at 94. The boys at reddit/guns are in mourning and shock. But it’s Soviet propaganda that makes him the sole designer of the weapon. Exactly how the winning design was created remains murky, but contrary to Soviet propaganda, it is clear that Kalashnikov got plenty of help — not only from other Russian konstruktors but (more embarrassing) from a captured German arms designer, Hugo Schmeisser, who during World War II had created an early assault rifle (the Sturmgewehr) that bore an uncanny resemblance to what became the AK-47. But even though the AK-47 was the product of considerable collaboration, it was Kalashnikov who got the glory. He was twice named a Hero of Socialist Labor and acquired sufficient riches to buy a refrigerator, vacuum cleaner and automobile — all scarce commodities in postwar Russia. Eventually he would become a lieutenant general and a world-famous symbol of the Soviet arms industry. I will always be a fan and advocate of the Stoner design, and as an engineer I like and appreciate the tight tolerances on my AR-15. It’s a precise and well functioning weapon, and I don’t like the feel of the clanking and rattling of the AK-47. Around my house we speak the name of Eugene Stoner with hushed reverence. However, there is no questioning the fact that the name Kalashnikov is significant around the world, and the weapon named after him has been an important feature of modern world history – just as has the Stoner design. If Not Guns, Is There Anything We Can Talk About? If we have learned anything in the year that has passed since 20 young children and six adults were murdered at Sandy Hook Elementary School in Newtown, Conn. (also dead were the shooter, Adam Lanza, and his mother, Nancy), it’s that Americans are incapable of having a rational discussion of the role of guns in our lives no matter how many tragedies they have endured.On the first anniversary of the shooting, President Barack Obama called for new gun-control measures, but there will be none. There won’t even be a serious discussion of the possibility of trying to stanch the flood of guns in this nation. Congress and most states gave short shrift to gun-control measures in the past year, and, in Colorado, one state that approved minor changes in the law, lawmakers found themselves the target of a well-financed recall campaign. Already, two have lost their posts. Oh, we’re quite able to talk about guns. We have non-stop for more than one year now, and before then always when the collectivists are in office. It’s just that the country has listened and replied a resounding no. The collectivists don’t like the answer, and thus the charge that “we can’t talk about it,” or in other words, we can’t talk you into our plans for national disarmament and reservation of the use of force to government forces of occupation no matter what falsehood we purvey. Joe Manchin knows the same to be true. Note that Joe still has hopes of disarmament of the American people, he just thinks it won’t work. He hasn’t lost his progressive, collectivist credentials. Once a totalitarian, always a totalitarian – a lesson we hope that America has learned well when it comes time to cast a vote for gun grabber Chris Christie. And as for universal background checks, we all know that it wouldn’t stop there. But that doesn’t mean that we don’t oppose universal background checks on principle. I oppose it whether it leads anywhere else or not. It has nothing to do with crime. That’s just a lie told by the hive. Imagine you’ve volunteered to participate in a study on a college campus. You arrive to find the lab somewhat cluttered: There’s a badminton racquet and some shuttlecocks on a table. The researchers tell you to ignore that stuff — it’s for a different study. They hook you up to a machine that administers electric shocks, and hand the controls to another participant like yourself. He zaps you. Repeatedly. (He’s secretly part of the research team, following specific instructions — but as far as you know he’s just being a jerk.) Now it’s your turn to zap him. How many shocks will you administer? A later study at the University of Utah refined our understanding of the weapons effect. Psychologists watched the behavior of drivers stuck at an intersection behind a truck that wouldn’t budge when the light turned green. Sometimes there was a gun displayed in the truck’s rear window and sometimes there wasn’t. The researchers observed that people honked more often when they saw the gun. Recent experiments have shown that even when nobody has been tormenting you with electric shocks or inciting your road rage, you’ll react to a gun differently than you’d react to other objects in your environment. You’ll automatically see the gun as a threat, without even realizing it. When I read this article I didn’t imagine at all that I volunteered for a study. What I did imagine is a world in which psychologists have to train in something useful and worthwhile to mankind and get a real job that earns a living doing something good and productive with their time. But it was all just a day dream. The “threat superiority effect.” There you have it. I assume that there were some government dollars in their somewhere. And that’s what you’re promulgating to the world when you openly carry a weapon. Threat superiority. Okay. If they say so. Against armed sociopaths, unarmed protection is severely limited, and New Jersey gun laws ensure the advantage goes to the predators. Like I discussed here, you can contrast that with shall issue states. The picture is stark and self explanatory. Gun control laws are unsafe. They prevent people from doing their duty of defending themselves and their loved ones. Thus they are all evil. I’ve covered their meddling here. To me this is simple. If I won’t allow the U.S. federal government to steal my firearms, I certainly won’t allow foreign bodies – armed or not – to do the same. Case closed. If you want conflict, bring it. ‘Nuff said. Comparing gun control to the Holocaust is one of a number of faulty and offensive analogies the gun rights movement has used to illegitimize [sic] gun reform measures. Kurt is covering the progressive Jewish reaction to the use of the holocaust to assess gun control measures. I saw this too and hadn’t commented on it, and Mr. Abraham Foxman says to us, “No matter how strong one’s objections are to a policy or how committed an organization is to its mission, invoking the Holocaust to score political points is offensive and has no place in civil discourse.” Well, let me respond by saying that a hit dog always yelps, and if the comparison is valid, I’ll make it any time I want. Oh, and don’t tell me what to do, Mr. Foxman. Uncle notes that Mayors against guns merges with Moms Demand Action. I see this as a sign of weakness rather than strength. Sort of like when Ansar al Sunna merged with al Qaeda in Iraq when both began to lose to the U.S. Marines deployed in the Anbar Province. Did I just really make that comparison? I guess I did. So be it. Gave his life to the community? You mean to tell me that he didn’t get paid for his work all of those years? He did it all for free? Store owner Mohamed S. Ahmed, 41, had the “back of his skull split open pretty good” from being pistol-whipped by one of the suspects, said Matt Dosser, who came upon the unfolding crime scene and cared for Ahmed until police arrived. Police said Wednesday that the armed citizen, who said he has a so-called “permit to carry,” acted with honor and probably saved Ahmed’s life. But, they added, holding such a permit does not mean having the same law-enforcing rights as a police officer. At first, “nothing made sense, then I saw the gun” that one of the two had, Dosser continued. The gunman “turned around and looked at me,” Dosser said. “He stared at me. I had my weapon up. I didn’t point the gun at the person. I had it at the ready, out of the holster. In 2003, Minnesota’s so-called “shall issue” permit law took effect, making it easier for residents to carry loaded weapons in public. Leave it to the police to throw a wet blanket on the honorable act by setting themselves apart from citizens, just so that you know. It’s important to them that you know they are special. He’s lying anyway (see Castle Rock v. Gonzales). Regarding the incident above, the man’s life was probably saved, and even if not, he got medical assistance sooner than would otherwise be the case. In contrast, folks in Newark, New Jersey are facing an epidemic of crime. Short Hills, New Jersey (My9NJ) – The two suspects wanted for the recent shooting of a young lawyer in front of his wife during a carjacking gone terribly wrong at Short Hills Mall, are still at large. The couples’ stolen SUV was found the following day abandoned in Newark and New Jersey’s largest city ranks among the top in the nation for vehicle thefts. There are about 400 carjackings a year in Essex County alone. While Los Angeles and New York rank high in carjackings, Newark takes the cake. In fact, people in Newark are known for posting videos of stolen cars doing drag races, donuts and drifting in the streets. Often times, in the videos, you can see cop cars chasing the reckless divers on the city’s main streets. Perhaps the motorists need guns for protection, and I’m willing to lay good money on the notion that the carjackings would stop if several of these criminals got shot during the act. Er … oh yea. New Jersey isn’t a shall issue state. And Chris Christie – presumed candidate for the highest office in the land in several years and who made his fame pushing gun control – was unavailable for comment. Perhaps we are asking the wrong questions in our national gun control debate. The issue is not whether we should have gun control laws in this country — or what they should be. The issue, really, is why so many white middle-American men view any effort to regulate firearms as an assault on their very identity — and thus fight sane and rational laws as if their lives and liberties were at stake. And the answer may have less to do with guns themselves than with the diminishing status of white men in America over the last few decades. According to data from both the Pew Research Center and the General Social Survey, while the percentage of Americans who own guns has declined in recent years, our nation remains awash in firearms, and the reason is that middle-aged white men are buying more and more guns, and gun ownership has become increasingly concentrated among them. A study published in 2007 by The Injury Prevention Journal found that 13 percent of Americans — mostly men — own four or more guns, and the 20 percent of gun owners with the most guns possess about two-thirds of our nation’s stockpile. The likelihood that these men will own a gun increases the farther they live from a city, yet it’s not because they are hunting more. When the General Social Survey asked men if they hunted in 2012, only a quarter said yes, compared to about 40 percent in 1977. So guns are no longer merely functional hardware for the enjoyment of outdoor sports and hunting. Increasingly they have become something else: totems of manhood and symbols of identity for a cohort of white, middle-American, rural and exurban men. Says the effete urbanite. Seriously, it’s always humorous to watch self proclaimed “smarter than thou” analysts try to assess us. The first thing that occurs to me is that he may have given away the farm in this analysis. The narrative is that there is an uncontrolled river of guns in America, leading to the epidemic of violence we face. What the man is saying is that the guns are being horded by men who aren’t committing the crimes. Oh, this won’t do for the progressives. He may have to backtrack his assessment. Second, it’s always interesting to see the breadth of the sweep in the assessment. It’s white, male ownership of guns that’s the problem, with men trying to be significant again. But notice that he fortuitously leaves out the police from the assessment. They couldn’t possibly be affected by such a malady. Otherwise, perhaps they shouldn’t have guns either. Or something makes them different – he doesn’t say. Then there is the issue of why most crime is being committed by blacks rather than the white males he lampoons. He doesn’t go there presumably because it is taboo. In all it’s a silly and trivial article, but it does go to show what fake scholarship looks like and what they think of us. What he doesn’t know is that there is a reason for ownership of these weapons being concentrated. Will he figure out what it is?